I live in the US in Pennsylvania. I'm a grandmother of 9 and a great grandmother in December of 2017. I've always loved playing video games and when I retired, I needed something to play for just fun and to keep my blood pressure down. 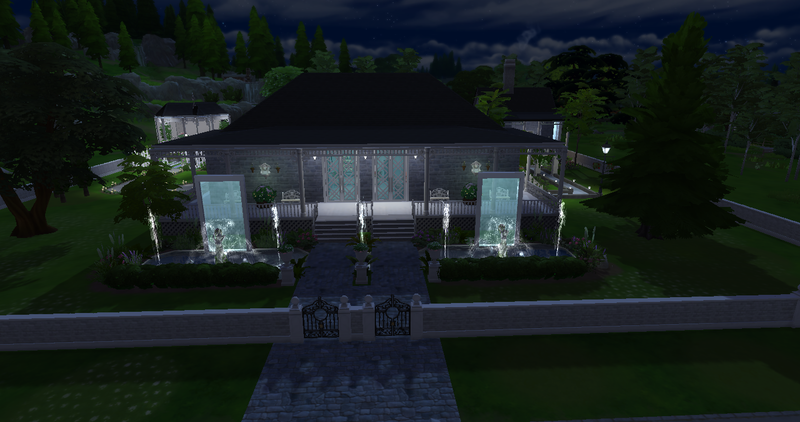 I discovered Sims 4 in January of this year and have enjoyed building anything I could build. I don't actually play with sims characters much other than testing the homes/businesses out. 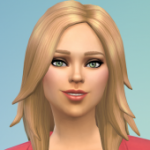 I do like creating the sims characters, just don't use them much as play characters. I discovered this forum months ago but only got active over the last few months. I love entering the challenges because I have learned so much from creating with a goal. The other builders on this forum are just amazing. Even though I'm not as accomplished as some other on the forum, (but do plan on working toward that), I thought I would share some of my favorite builds I have done. All are play tested. I'm still a kind of new at this, but I'm having a blast. I'll try and keep loading new homes often. 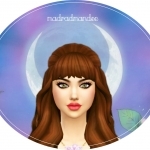 Origin ID: kimartist, please follow me in the gallery to see my newest work. I thought I would feature it first. Modern meets traditional in this three-story home with extensive landscaping. My favorite room in the house is the Kitchen. Raise Your Children Here and Large Country Colonisl are both very nice homes! Very nice exterior design of the two homes! 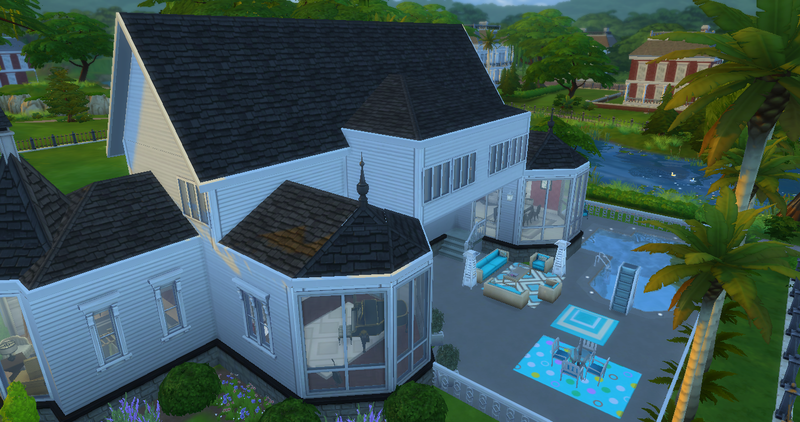 Very nice roofing and layout of the first family home. The flowers along the edges of the home look very pretty! The water fountain is a nice touch in the front garden. Very nice back patio outdoors living, dining and pool area! 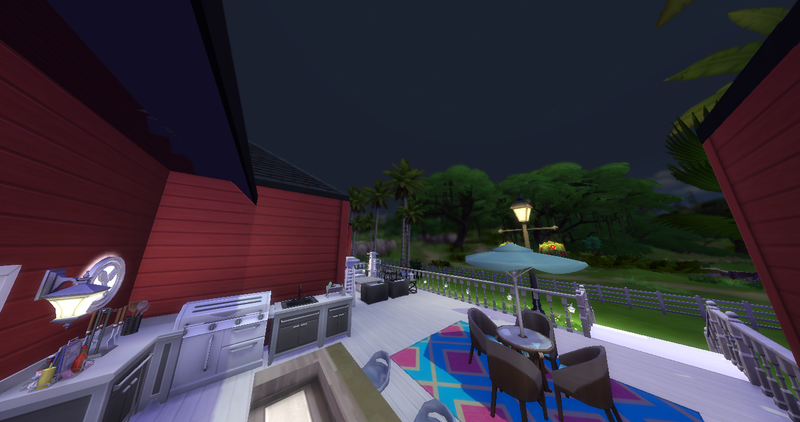 Sims will enjoy cooking meals on the BBQ and eating the food in the outdoors air at the table. They will enjoy relaxing on the sofas,and armchairsxn in the sunshine , or have fun swimming in the pool. The row of tall,tree lining the edge of the lot looks very nice. Very nice furnishing of the interior of the home! 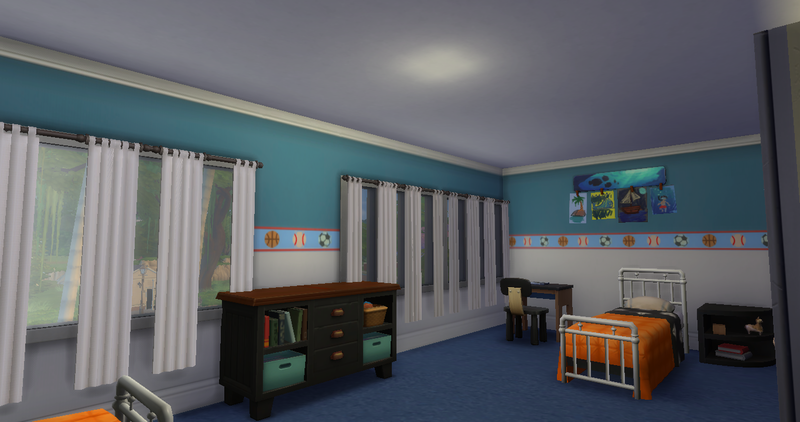 The pink and blue colour scheme of the first kids room is very pretty! The colourful circles floor prints are a very nice touch in the room. The anlmal themed armchair are cute for sims to sit in! Very nice open plan layout of the kitchen and dining area. 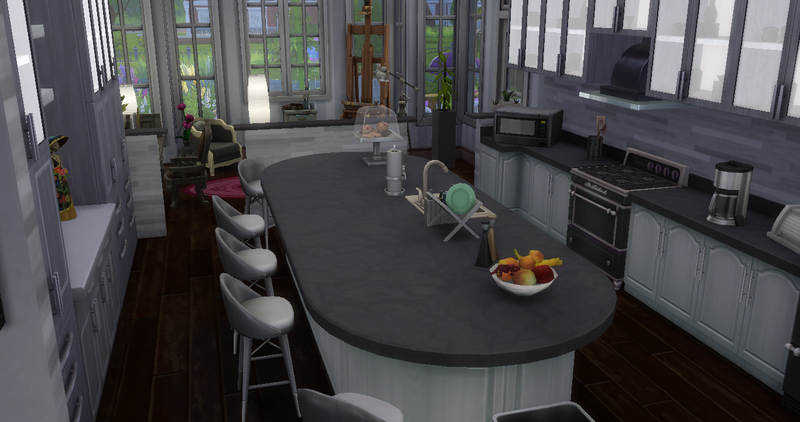 The placement of the kitchen cabinets looks very nice! The nook with the sunflowers is very nice! The flowers are sunny for sims to see when cooking there. Very nice windows dining area! Sims will enjoy eating their meals at the table with sunshine coming in onto them. The flowers are a nice touch on the table. The sports patterned walls in the boys bedroom looks nice. The kids paintings are proudly on display on the bedhead wall! 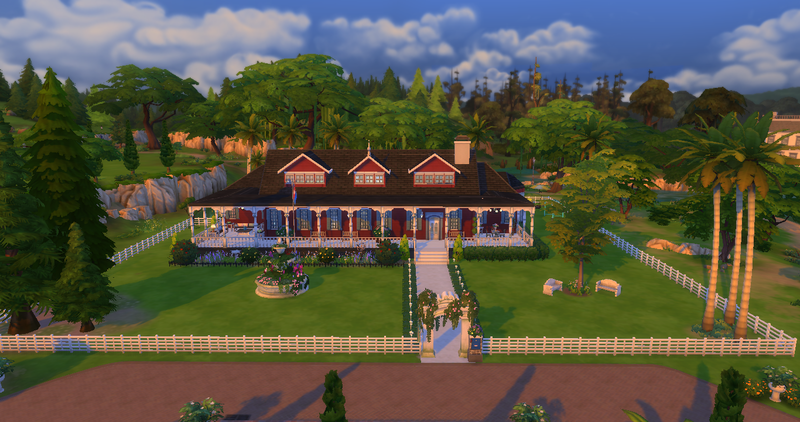 The Country Colonial home looks so grand and very nice! The dormers, wraparound porch, and red colour of the exterior looks so very nice! The floral archway entrance to the lot and the greenery lined front footpath look very nice! Very nice pool and hot tub area. Sims will enjoy relaxing in the tub. The outdoors living, kitchen and dining patio areas are very nice in this home also. 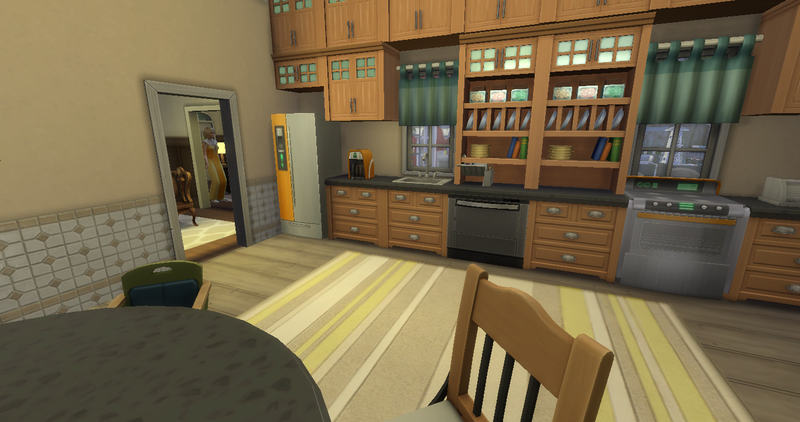 The designof the kitchen looks so very nice! 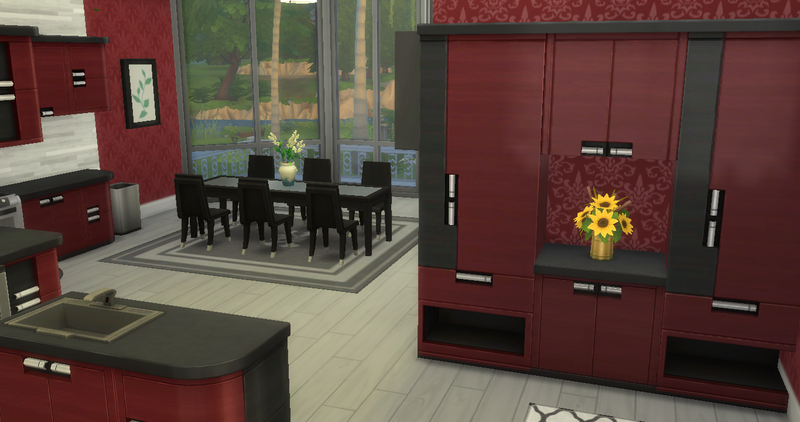 The cabinets and counters from Parenthood pack look so very nice on and against the walls there! The curtained windows nooks are nice. Very nice computer nook in the kitchen. The curved bar stool counter windows dining alcove looks so nice! 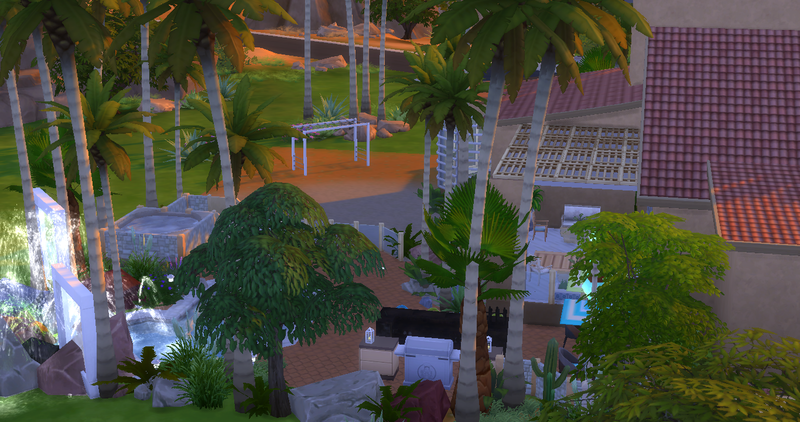 Sims will have nice views of the outdoors whilst dining there. The fruit bowl and condiments are nice touches on the kitchen table. 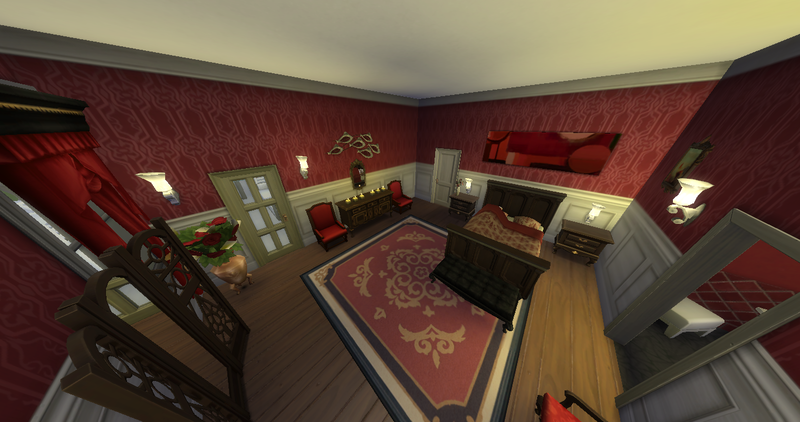 Very nice furnishing of the master bedroom! The red and white colour scheme and the wall paneling look very nice. The candles look pretty on the dresser. The homes are very special for families to enjoy living in! Here is another build I have done. Not every being any further west than Chicago..this was a challenge for me. I loved building this one though. Have a great time living in this home. Fantastic Backyard. . The Elite Palace was build for #QCMonthly20. It was the first challenge I ever did, so I glad it was just for sharing. 6 Bedroom with a sitting area and Private Bath, plus 2 additional bedrooms. Guards Gate A wonderful royal get-a-way for young couples and their friend. Private Bed and Bath for 6 couples. Private Spa, Gym, Movie Theater, Dance Center. Butler Apt too. Too much to mention. The exterior design of the home and the layout of Backyard Oasis looks so very nice! Very nice roofing on the home! 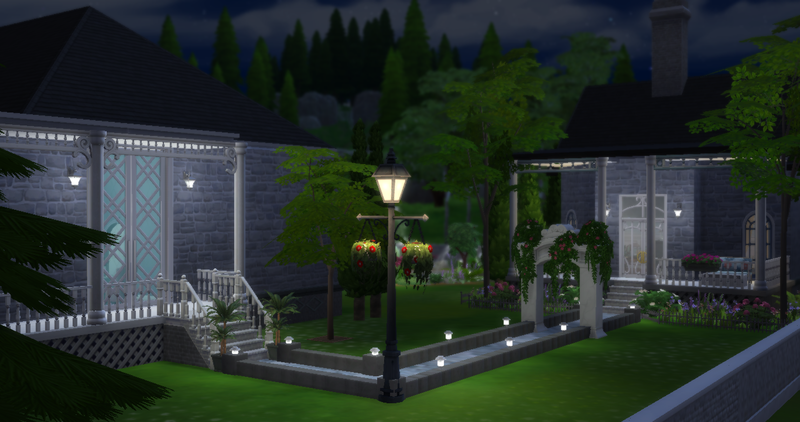 The backyard areas look so very nice! 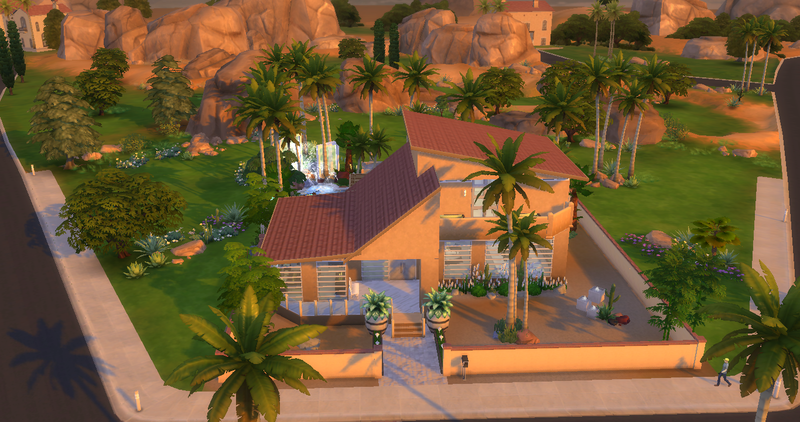 They do look like an oasis for sims to retreat to. The trees look great, and the hot nook is very nice! Sims will enjoy relaxing in the tub. The hot tub small patio and steps is a nice touch. The water feature windows, rocks waterfall and the pool looks so very creatively pretty! It looks so nice! Very nice outdoors dining and bar area! 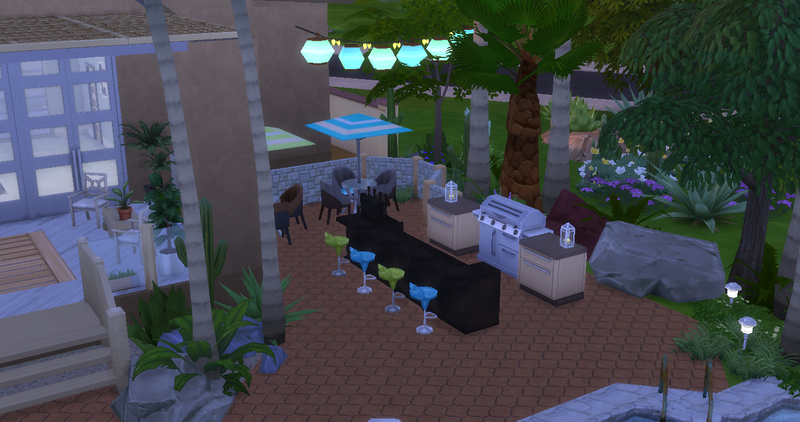 Sims will enjoy cooking on the BBQ and eating the food at the dining table in the outdoors air. They will enjoy sitting on the stools having a drink from the bar. The alternating colour of the stools is a nice touch. 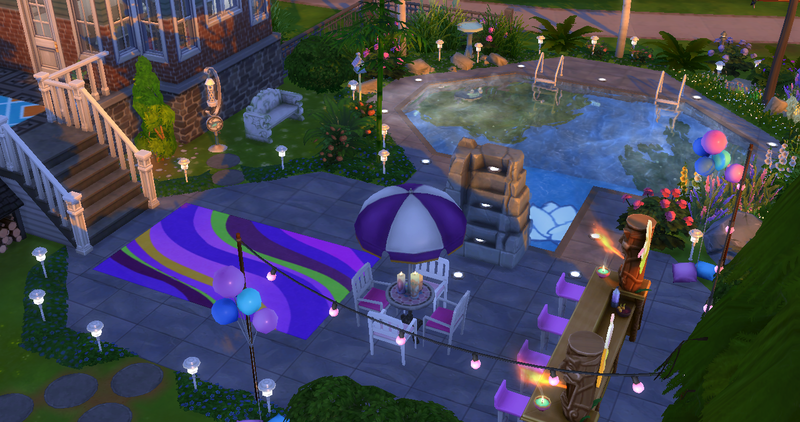 The string of lantern lights and the candles on the side tables beside the BBQ are pretty touches. 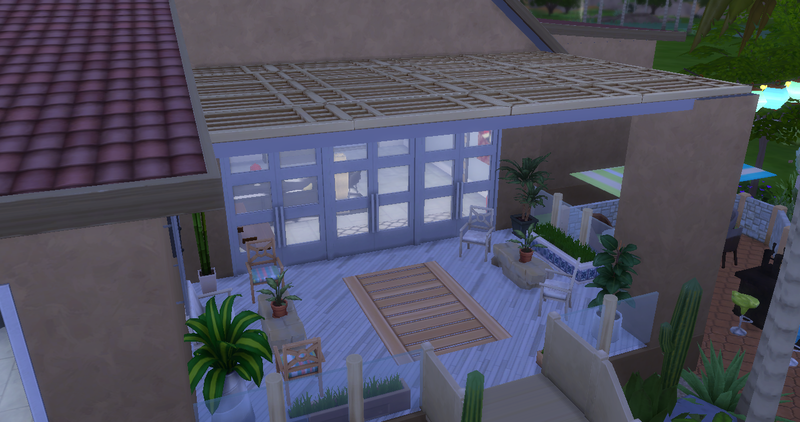 Very nice sitting area on the back patio for sims to rest there, and have a chat whilst looking at the calming backyard setting. The trellis roofing is very nice. The Elite Palace looks so very grand! As I said in the earlier post, the exterior design and the layout of the build looks so very nice ! The towers look great! The water fountains are a nice touch on either side of the front entrance. Very nice outdoors areas! The pool and the outdoors dining and bar patios are very nice. 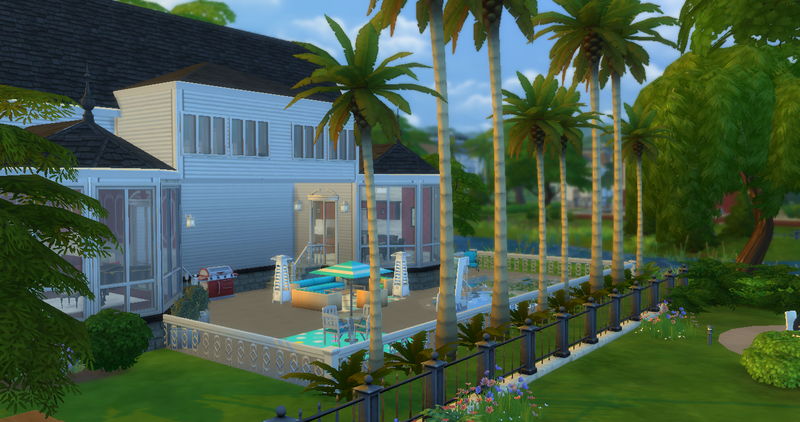 Sims will have fun swiiming in the pool or enjoying sitting at the umbrella covered tables in the outdoors air, eating food they have cooked on the BBQ. They will enjoy enjoy sitting on the stools having a drink from the bar. Very nice furnishing of the interior of the home! 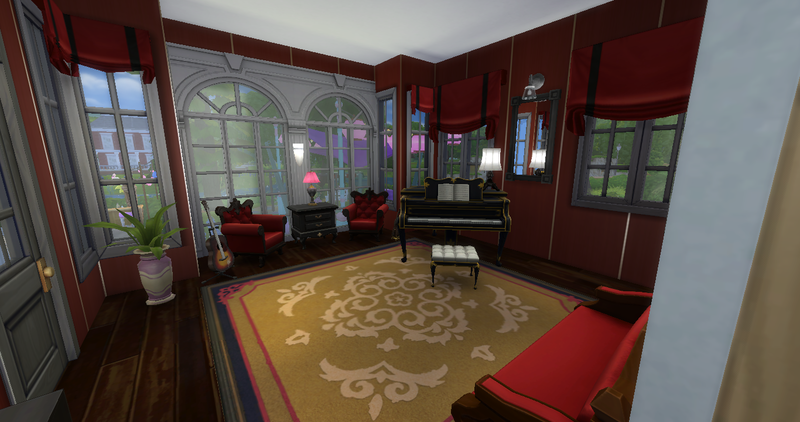 The music room is very nice! Sims will enjoy sitting resting on the sofa and armchairs there, listening to the piano musuc or reading a book near the fireplace. The flowers and candles are pretty touches on the fireplace ledge. 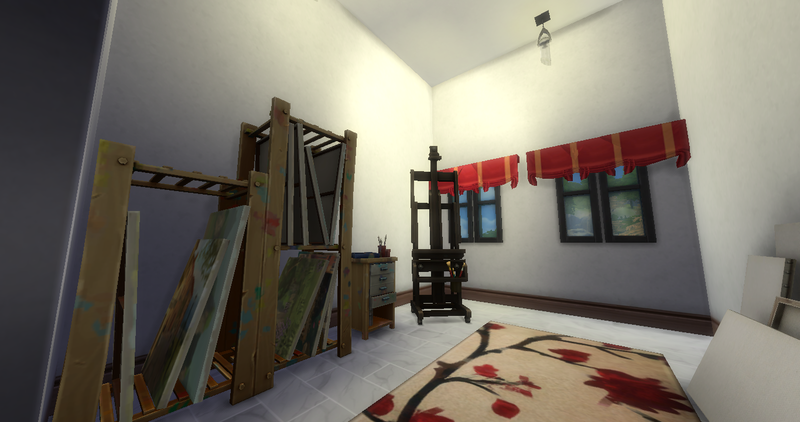 Nice art room for sims to enjoy painting on the easel. The art decor items look great there! The dining and bar room area looks very grand! The long dining table and the type of chairs on the sides and ends of it looks very nice! The patterned floor rug and the elegant ceiling lights gives such a very nice look to the area! Very nice double bar area! The drinks display shelves look very nice how they are placed on the walls. Sims will enjoy having a drink there after a meal. The curtained nook area with the tables, chairs and piano looks so very nice! Very pretty sitting area. where the seat benches are around the floral sculture! The hanging basket lamps are a nice touch there, The water feature with the follies, water window and statue looks very nice! It is a very grand and regal home! the roofing as well. the kitchen looks very classy. 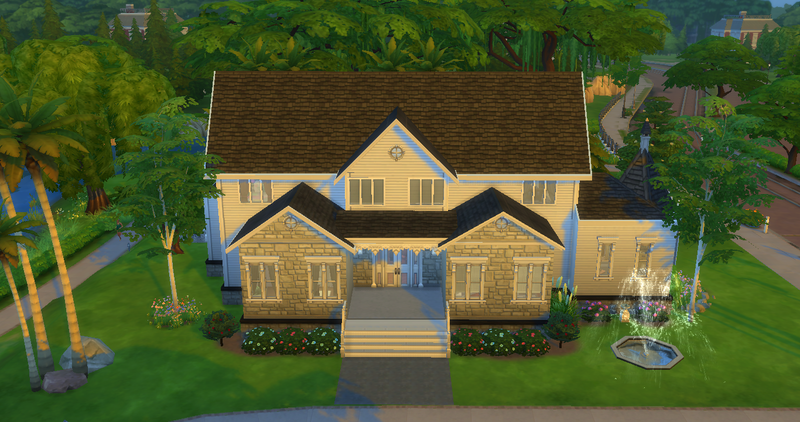 my jaw dropped at your Large Country Colonial with Wrap Around Porch! your landscaping is lovely! 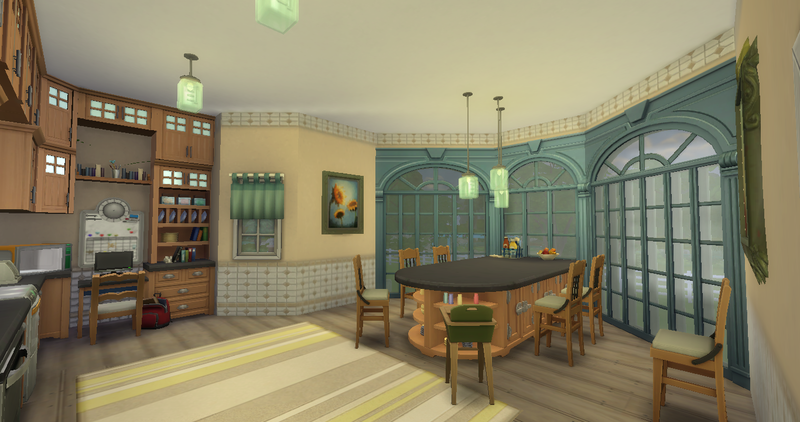 the interior is just as lovely and just as detailed! like your other builds ,extremely detailed. Wow your builds are spectacular! I can't wait to check them out on the gallery! Thank you so much @MadRadMandee . I hope you will. The Grand Entrance to the inside/outside Chapel, the reception hall and the honeymoon suite. At each corner of the estate is an welcome sign to the estate. 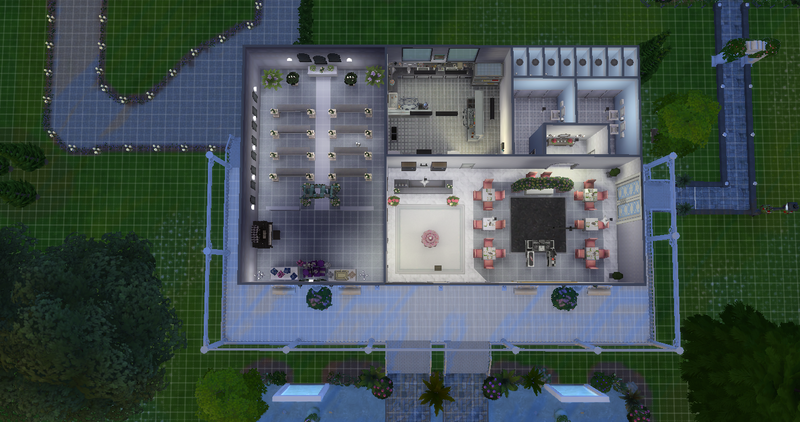 Shows the inside chapel, gifts table, bar, reception area with dance floor and DJ, Chef's Kitchen and bathrooms. 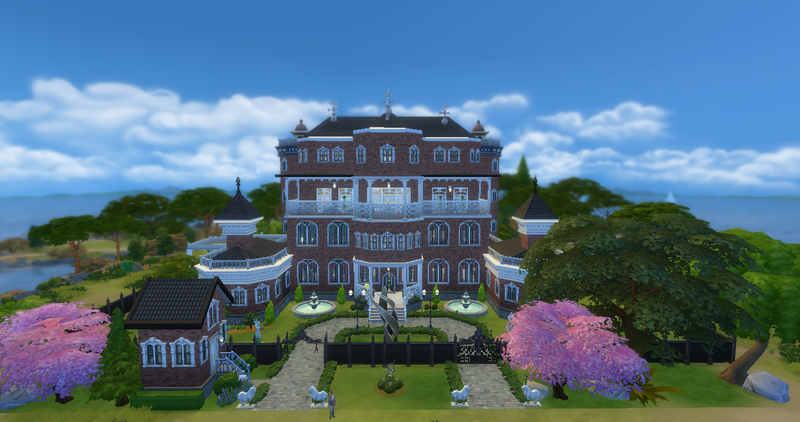 Grand Wedding Estate is such a very pretty place for the sims to enjoy getting married! Both the indoors and outsoors areas look very pretty! The water fountain features in the front areas of the build look very nice. 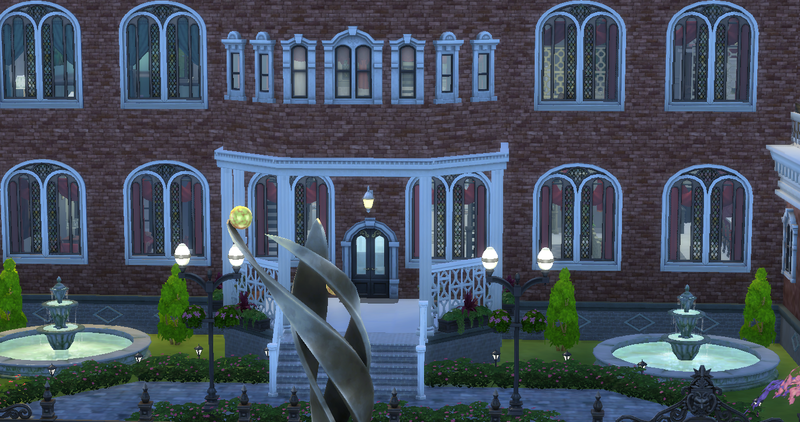 The welcome sign with the statue, water windows, rocks, water fountains and flowers on the corners of the venue, looks so very nice! Very nice layout of the interior of the venue! The design of the outdoors Chapel area looks so very pretty! The two flights of steps, the way that the spandrels are used, the floral water sculpture in the nook, and the flowers and candles in the undercover area look so pretty! It looks very nice how the chairs have been set up there for the wedding guests to enjoy watching the wedding ceremony, with aisleways between them . The bonsai plants are a nice touch there. 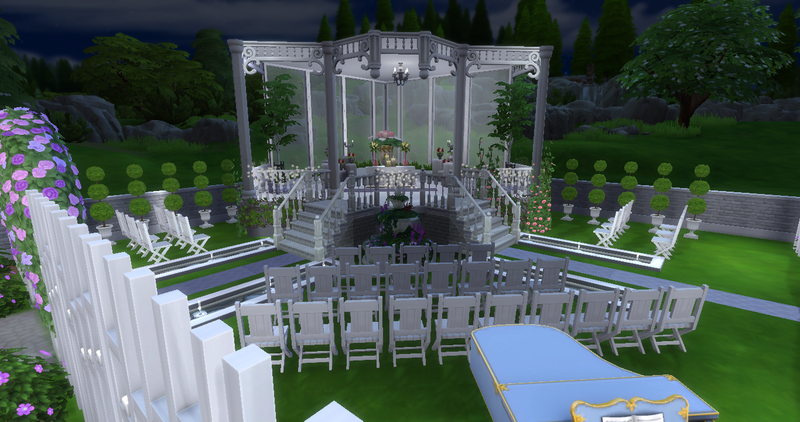 Sims will enjoy listening to the piano music during the wedding. The walls of candles bordering the area, and the floor lights on the edges of the pathways look so very special! Very nice indoors wedding ceremony area! The butterflies and the candles on the pedestals on the edges of the pews look very pretty! The dome type windows look very nice in the venue. It is nice that there is a hot tub nook in the honeymoon cottage. The water windows look nice bordering the nook area. Very nice pond area! The flowers, rocks and plants look so very pretty on the edges of the pond! The fountains in the pond is very nice. 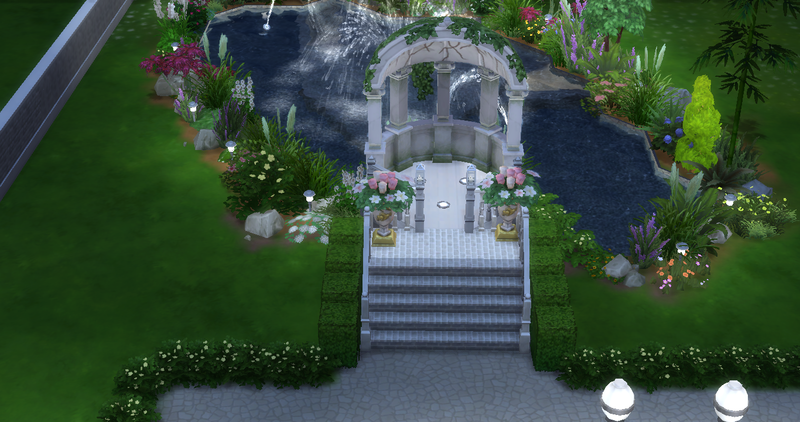 Nice raised folly for the sims to enjoy having wedding photos in. The vases of flowers there look pretty. It is a very special and pretty wedding venue! I had a look at the other wedding photos in your album and they are all so special! Grand Wedding Chapel is so beautiful! 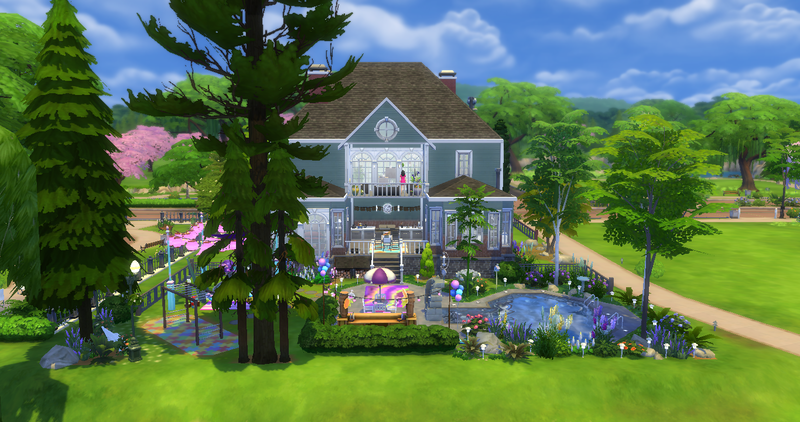 Nearly impossible to pick any favorite detail but I especially love the gazebo area, the landscaping, and the pond. Thank you @fizzlegig I just started building a few months ago. Hoping to keep getting better. Finally had a chance to build a house that isn't in any challenge. The exterior design and the layout of the ourdoors areas of Essential Family Home looks so very nice! The flower box bay windows at the front of the home look very pretty! The water fountains look very nice either sides of the front patio entrance. The design of the back patio areas looks so very nice! The pool looks very great ! Very nice outdoors dining and bar area! Sims will enioy sitting on the stools having a drink from the tiki bar.Kids will have fun playing on the monkey bars, and the colourful jigsaw floor patterning look very nice! The colourful balloons add a special look to the area. Sims like watching the birds on the seed feeder. The floor lights look very pretty! Very nice furnishing of the interior of the home! Very nice design of the kitchen! The oval bar stool and sink counter looks great! The cake item, fruit bowl and dish rack are homely touches. Very nice grey colour scheme of the room. It is nice that there is an art nook off from it, for sims to enjoy painting on the easel with sunshine coming in through the windows . The dining room is very nice! The type of dining seating used looks very nice. The fruit bowl and teaset are nice touches on the dining table. 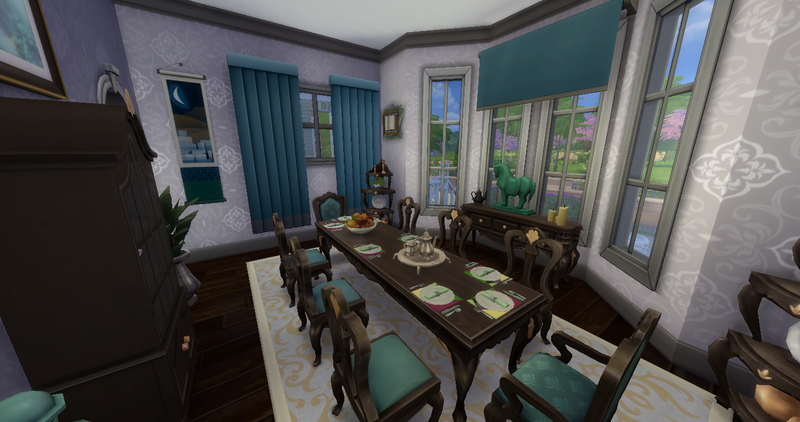 Sims will like looking out through the windows at the views whilst eating their meals. The wall pattern looks very nice and complements the blue curtains. Very nice music room! 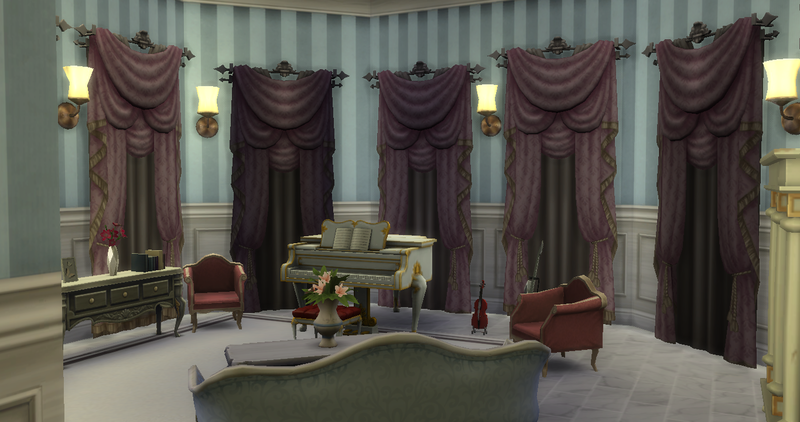 Sims will enjoy sitting resting in the armchairs listening to the musical instruments being played. The golden floor rug and the red colour of the seating look very nice together. 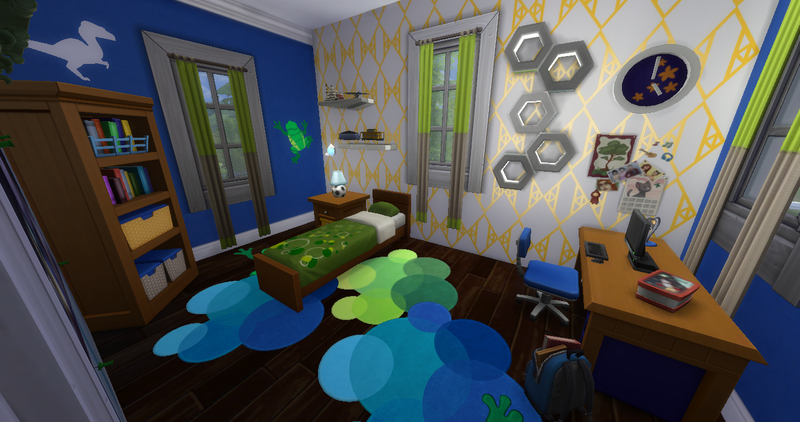 The colour schemes and furnishing of the kids rooms looks so very nice! Very nice study desk nooks for them to do their homework at the desk table and also enjoy using the computer . 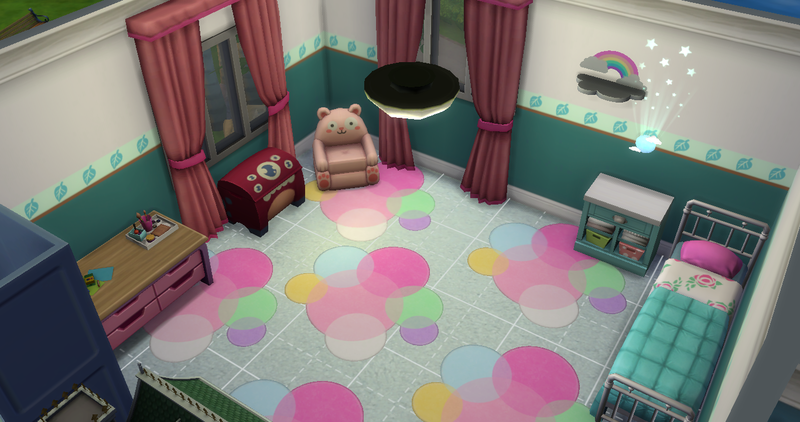 The coloured circles floor prints in the boys room looks great! Very nice golden wall pattern. The heart teddy in the girls room is cute! The confetti looks pretty on the wall. It is a very special family home! @kimartist these houses are insane! I am a sucker for the large colonial. I'm adding it to my game! Thank you @squiona, I really appreciate it. I love building large and small houses. 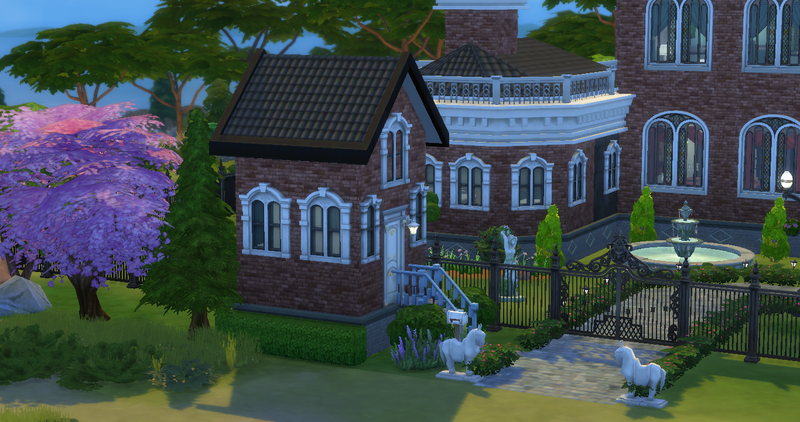 I seem to have issues when it comes to medium size houses.